British political economist (1772-1823). He was one of the most influential of the classical economists, along with Thomas Malthus, Adam Smith, and James Mill. 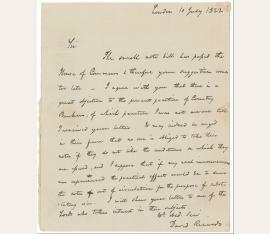 Autograph letter signed, discussing the problem of small bank notes issued by country bankers, to Thomas Joplin [?]. London. Quarto, 18.6 x 22.5cm, leaf edges gilt, 1 page in ink, preserved in a green cloth slip case. Unpublished David Ricardo replies to a correspondent who had written to him about the practice of country bankers in relation to small bank notes. Ricardo writes that his correspondent’s suggestions come too late, as the small note bill had been passed by the Commons but that he would pass them on to a member of the Lords who is interested in this subject. Ricardo states that no one is obliged to take notes from country banks if they object to the conditions of issue and that in this case this would lead to them being driven out of circulation and being substituted for coin. In Ricardo’s Plan for a National Bank [written in 1823 and published in 1824 after his death] in his 14th regulation he supported the idea that £1 notes should be “issued and shall be given to any one requiring them in exchange for notes of a larger amount, if the person prefer such notes to coin. This regulation to continue in force only for one year, as far as regards London, but to be a permanent one in all the country districts”. London 10 July 1822 Sir The small note bill has passed the House of Commons & therefore your suggestion comes too late. – I agree with you that there is a great objection to the present practice of Country Bankers, of which practice I was not aware till I received your letter. It may indeed be urged in their favor that no one is obliged to take their	notes if they do not like the conditions on which they are issued, and I suppose that if any real inconvenience was experienced the practical effect would be of substi- tuting coin. I will show your letter to one of the Lords who takes interest in these subjects. yr.obed. serv. David Ricardo From recent research by Professor Christophe Depoortere of the University of Paris he believes this letter was addressed to Thomas Joplin [1790?-1847], an English timber merchant and banker. Professor Depoortere writes “If I am right, this means you are in possession of the only known letter of Ricardo to Joplin...” 1) Historical evidences Ricardo starts his letter by “Sir” and finishes by “yr.obed. serv.”. Those formal introduction and ending are quite cold and rather unusual in Ricardo’s correspondence. Indeed, when he his acquainted with his correspondent, Ricardo usually starts by “Dear Sir”, “My dear Sir” or “My dear Malthus, My dear Trower…” There is actually only two correspondents in volume IX of Ricardo’s Works which start by “Sir” only: the first one is to Foster, Peter le Neve (letter 489), the second one to John Wheatley (letter 457). In both cases, Ricardo was not well acquainted with his correspondent. The researches I have made on the relationship between Ricardo and Joplin lead me to think that Ricardo and Joplin got acquainted with each other in 1822 but not earlier and your letter could be Ricardo’s answer to the first (or one of the first) letter addressed to him by Joplin. In February 1822, Joplin published a pamphlet: An Essay on the General Principles and Present Practice of Banking in England and Scotland, with Observations upon the Justice and Policy of an Immediate Alteration in the Character of the Bank of England, and the Measures to be pursued in order to effect it calling upon the inhabitants of Newcastle upon Tyne to form a Join Stock Bank (Joplin 1832:1). This pamphlet made a great impression in Newcastle, but though Joplin’s efforts, it founded no support in Parliament (Joplin 1823:v). Then, he undertook to write his Outlines of a System of Political Economy written with a view to prove to Government and the Country that the Cause of the present agricultural Distress is entirely artificial; and to suggest a Plan for the Management of the Currency that he projected to publish before the next session of Parliament (Joplin 1823 xvi). This book seems to have been published during the first quarter of 1823 (O’Brien 1993:38, n5 says in early march 1823). Then, wrote Joplin, he “applied, […] to the late Mr. Ricardo with whom I had previously become acquainted, and proposed to him, as a question peculiarly to his own, to bring the plan forward in Parliament […] My plan merely gave a more practical turn to his views on the subject. He had not, however it appeared, lost sight of it for a moment: for after his death [on 11 September 1823], which took place in less than six or eight months, a pamphlet was published by his friends, written by him in the mean time, entitled A Plan for a national Bank “(Joplin 1832:179). Joplin then condensed the propositions of his book in the form of a petition that was presented on 2 June 1823 to the House of Commons (O’Brien1993:15). 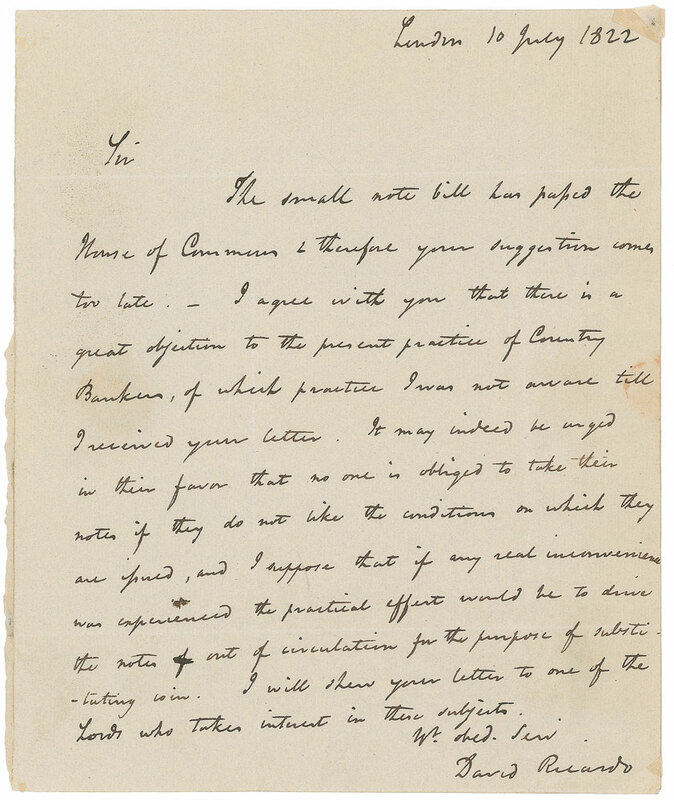 However, “with the exception, therefore, of a speech from him [Mr. Curwen who undertook to present the petition and made a speech upon it] which was neither heard nor reported, and two or three words from Mr. Ricardo, it met the general fate of petitions” (Joplin 1832:190). Joplin probably got acquainted with Ricardo in May or June 1822 (Ricardo left for his tour on the continent on 12 July 1822). Indeed, “during the dependance of the question [the renewal of the bank Charter (30 May 1822)], the author [Joplin] was in London for a couple of months” and he seems that he was looking for some support in parliament. He had “an interview with Huskisson on the Bank subject” and he wrote him a letter entitled: A few consecutive Propositions in Political Economy, which are capable of Proofs (1823:xvi) to which Huskisson answered on 6th July 1822. It is possible that he also met Ricardo during his stay in London and that he wrote to him at the same period for Ricardo’s answer to an “unidentified correspondent” is dated 10 July 1822. 2) Analytical evidences (remains to be written) References Joplin, Thomas (1822). An Essay on the General Principles and Present Practice of Banking in England and Scotland, with Observations upon the Justice and Policy of an Immediate Alteration in the Character of the Bank of England, and the Measures to be pursued in order to effect it. In Joplin (1823). Joplin, Thomas (1823). Outlines of a System of Political Economy written with a view to prove to Government and the Country that the Cause of the present agricultural Distress is entirely artificial; and to suggest a Plan for the Management of the Currency. London, Haldwin, Cradock, and Joy. Joplin, Thomas (1826). Views on the subject of corn and currency. London, Haldwin, Cradock, and Joy; and T. Ridgway. Joplin, Thomas (1832). An analysis and history of the currency question: together with an account of the origin and groth of joint stock banking in England. London, J. Ridgway. O'Brien, Denis P. (1993) Thomas Joplin and Classical Macroeconomics: A Reappraisal of Classical Monetary Thought. Aldershot, Edward Elgar See Piero Sraffa, Works & Correspondence of David Ricardo, Vol.IV, pp.289 Plan for a National Bank. See L.S.Pressnell, Country Banking in the Industrial Revolution. Oxford, Clarendon Press 1956 pp.126: From 1797 to 1825…notes of values down to £1 could be issued, and it was these small notes which more than anything else helped to spread a banker’s business…pp. 136: for small payments, private note-issues predominated in most areas outside London, especially between 1797 and 1825…these notes were the object of debate, criticism, and eventual restriction… pp.142: The Suspension of Cash payments by the Bank of England in 1797 gave scope for a great increase in the importance of country issues…pp.144: In 1816, with the return to the pre-war currency not yet achieved, the issue of small notes was scheduled to terminate two years after the resumption of cash payments by the Bank of England. Resumption took place in 1821, and therefore the small notes were to be withdrawn in 1823. But agricultural depression and the parliamentary pressure of the country gentry persuaded the government to pursue a reflationary policy. In 1822 the life of the small note was extended for ten years, until 1833; the crisis of 1825 shortened this period, however…the issue of all small notes was to cease in April 1829 See Sir John Clapham, The Bank of England. A History. Vol.II 1797-1914 CUP 1944; pp.75 The Act of 1816, which extended the suspension of cash payments but contemplated resumption in 1818, had allowed two years from the date of resumption within which the issue of notes under £5 was to cease. Ricardo, whose balanced mind feared “the evil consequences which might ensue from a sudden and great reduction of the circulation, as well as from addition to it”, had suggested in 1819 that it might be wise to continue the use of the £1 note – at any rate for some time – so as to ease pressure on the gold. His ideal currency would have contained such notes permanently “in all the country districts”, though not in London. But his advice had not been taken: the Act of 1816 still applied; and as resumption was antedated, at the Bank’s request, so as to begin on 1 May 1821, the issue of small notes was due to cease on 1 May 1823..